Good nutrition can make a tremendous difference in performance, muscle strength, balance, fatigue, and injury rates. Working with a registered dietitian who personally understands the demands of these unique performing athletes is the first step in improving performance, achieving a strong healthy weight, and reducing injuries. The dance world is a competitive environment in which dancers are expected to perform at high levels of physical fitness, and choreographic demands continue to increase as this art form becomes progressively more demanding. There is too much misinformation out there about nutrition that can be damaging. Being competitive in the dance world takes educated nutrition expertise. Without Emily Harrison’s knowledge, compassion, and utmost dedication to the field of nutrition and nutrition education, I can confidently say that I wouldn’t not have been able to sustain the dance career that I have had. I began working with Emily very early on in my career and continue to utilize her expertise to this day. Her passion for nutrition education and unrelenting desire to better the lives of dancers and performers is unparalleled and desperately needed in dance communities today. The NGP Resource Book is so much more than a book that sits on a shelf. 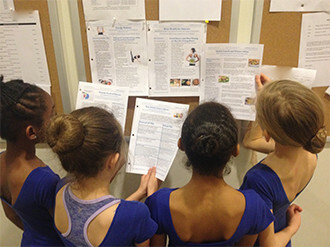 It is a well designed tool that gives dancers and school directors resources and handouts on key nutrition topics they can then share with their students or company members. In addition it contains recipes, smart snack ideas, and inspirational quotes from real dancers. It’s not a boring nutrition textbook, but a collection of resources laid out in a way that’s succinct, quick, easy to understand.